[SOFT WARM MATERIAL]: Acrylic inside. Cotton outside. The fabric on this knit gaiter is so soft, cozy, chunky, warm and not scratchy at all. It didn\'t have any weird smell. 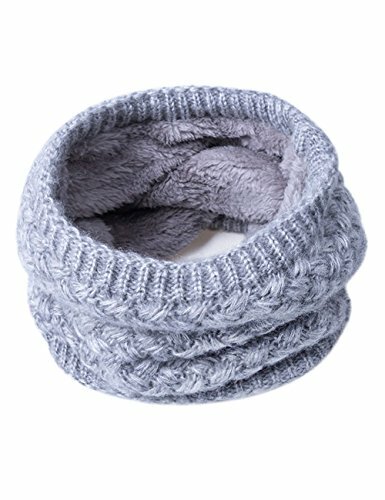 Wrapped around your neck will keep you warm, snuggly and nice. [SIZE AND MULTIPURPOSE USE]: 18.89\" Circumference× 8.26\" W. It is stretchy enough to sit comfortably around your neck without being too constricting. Perfect for attend a party, or family travel, or go to work suitable for you in different occasions. [FASHION DESIGN]: Nice rhombic ribbed knitted design with the soft thick fluffy lining is super stylish. You can choose different colors to decorate your different moods. Multiple colors to choose. Each scarf is packaged in a flat plastic zip bag with the scarf folded very neatly inside - perfect for gift giving. ND STRETCHY:This scarf is stretchable to fit different people and the fabric is very soft. [WASHING MAINTENANCE]: Please use warm water below 30 ℃ wash alone and do not use washing machine. Ironing on low heat and it is compatible with any dryleaning methods. [OUR WARRANTY]: We have given you an uncomplicated refund or return guarantee for 30 days. Just contact us if you have any questions, we can offer you a 24-hour real-time customer service that answers all emails within 24 hours.